For years now the genre of metalcore has been standing still. Content with it's place in the musical world, metalcore has spawned hundreds of bands with barely a difference between them. Reminds me of the Nine Inch Nails song, 'Everyday Is Exactly the Same'. 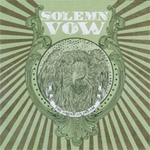 Now another band, Solemn Vow, has emerged and have unsurprisingly decided to join metalcore as it stands still in time. The American Dream is not bad, just extremely average. You've heard it all before but the band does it well. Guitars shine with some good riffs, drums have some great fills, and the bass is quiet, but has a solo now and then. I cannot fault the band's music but it's not breaking new ground or pushing any envelopes. An envelope would move farther if you put it in front of a glacier. Unless you have an extreme obsession with listening to every single release in the metalcore genre (and if so, I wish you luck), there's no particular point to picking up The American Dream. However, if you need a metalcore fix and also bands doing new and exiting things frighten you, you could do a heck of a lot worse than Solemn Vow.